Aims enhanced customer experience with extensive space. 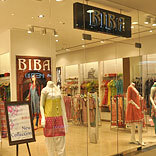 Indian ethnic wear brand, BIBA, has opened its first flagship store at Ahmedabad, Gujarat. The store, located at Alphaone mall, aims to enhance customer experience by providing extensive dedicated space for each of its product categories – MnM, SKD, Biba Girls and unstitched fabrics. Spread over 2,500 sq ft, the store is stocked with the latest collections of BIBA for Spring/Summer 2012. The store houses a wide variety of SKDs (Salwar Kameez Dupatta), Mix ‘n’ Match Kurtas, leggings and BIBA Girls, a dedicated segment catering to 2-12 year old girls.